... from the other side of the pulpit. However, I am concerned that modern Christianity has become a prideful beast which seeks self-glorification. I am concerned that the loss of humility, which has been replaced with mega-churches and dazzling and glittering worship services, has moved the church away from being the vehicle which delivers the good news. I long for the church to return to her calling -- to care for orphans and widows, to protect the weak, and to provide shelter for the homeless, all the while proclaiming the goodness of God through the death and resurrection of His son, Jesus. I long to say that I am proud of the church for the work that she is doing. In the same way Christ drove the thieving money-changers from the temple, I trust Christ will one day purify his church, driving out the wickedness that has been allowed to grow within its walls. That day will be a shock for those who erroneously assume that they are on the correct side of the pulpit. 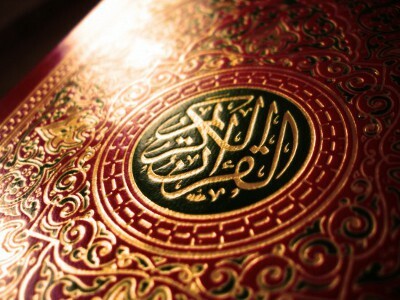 I wish that reason could cut through the stupidity that is the Quran/Koran-burning event going on right now. It is, unfortunately, difficult to reason with mindlessness. Burning the religious books just doesn't seem like the Christ-like thing to do. "They know nothing, they understand nothing. Who is more needy than the Haitians? Who is more poor, and has been more oppressed by the wicked? (we don't call it "predatory lending" for nothing) And where have the foundations of the earth been shaken? I believe the instructions to believers are quite clear. Why the prophecies and proclamations from Pat Robertson haven't led him to be on the receiving end of a stone-throwing revolt baffles me. Summary: Haiti was forced to pay France for its freedom. When they couldn't afford the ransom, France (and other countries, including the United States) helpfully offered high-interest loans. By 1900, 80% of Haiti's annual budget went to paying off its "reparation" debt. They didn't make the last payment until 1947. Just 10 years later, dictator François Duvalier took over the country and promptly bankrupted it, taking out more high-interest loans to pay for his corrupt lifestyle. The Duvalier family, with the blind-eye financial assistance of Western countries, killed 10s of thousands of Haitians, until the Haitian people overthrew them in 1986. Today, Haiti is still paying off the debt of an oppressive dictator no one would help them get rid of for 30 years. According to the Christian Broadcast Network (CBN), today is the Day of Prayer for the World's Economies. For these and other reasons Cindy is calling for a Day of Prayer for the World's Economies on Wednesday, October 29, 2008. They are calling for prayer for the stock markets, banks, and financial institutions of the world on the date the stock market crashed in 1929. They are meeting at the New York Stock Exchange, the Federal Reserve Bank, and its 12 principal branches around the US that day. The Wonkette directs us to this delightful scene. See anything wrong with this picture? 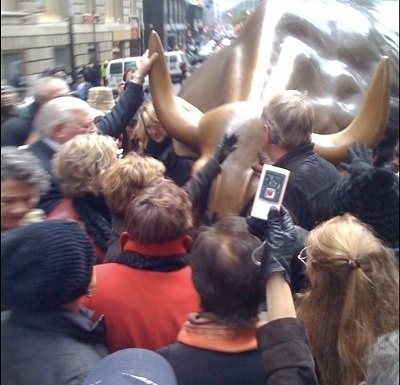 Well here they are, at the Wall Street bull statue thing, praying to Jesus for money. The dingbat has explained, "We are going to intercede at the site of the statue of the bull on Wall Street to ask God to begin a shift from the bull and bear markets to what we feel will be the 'Lion's Market,' or God's control over the economic systems." Pardon me while I puke into my church bulletin. It is as I expected. There's a movement that's arising out of the emergent church camp, and it's shiny and sparkly... and for sale. I ran across a link to deepshift.org, which is a site that promotes the notion of emergence -- the idea that there's a growing number of believers who are sensing a change in the winds of Christianity. It's part of this philosophy that trends away from the traditional and institutional church, towards a no-boundaries, freedom-to-worship-and-express model of Christianity. Freedom - that's been the missing element in so much of today's church, and it's this freedom that's being offered in the idea of the emergent church movement. - I've never felt like I fit in the traditional church. - I love Jesus, but I'm not too excited about Christianity in its current form or the church in its dominant expression. - When I read your books, I feel like shouting, "So I'm not the only person who feels this way! I'm not crazy after all - or if I am, I'm not the only one!" - It feels like we've kind of missed the point of what Jesus was about. - I'm not religious, and I'm not that sure what "spiritual" means - but I'm looking for something, some way of life or pattern that makes sense of things. - I used to be a pastor (or youth pastor, or church leader, or active church attender) but something stopped working. I dropped out and thought I had lost my faith, but when I read your book, I thought, "Maybe I can believe again after all." - The world's in deep trouble. Sincere people of faith need to find some way to make a constructive, creative difference. ... and all these things ring true for me and many of my peers. There certainly is a change, not just in expectations of what church should be, but also in how believers view the world around us. And that new perspective looks very little like how we see today's traditional churches. Everything is changing. But on the site, there's mention of their tour. And there's a newsletter to which you can subscribe. And links to books you can buy. And opportunties to sponsor the organization. Sparkly. Shiny. I can't help but be skeptical about this. It feels like there's a push to throw out the old masters, in order to replace them with... the same old masters, who are simply wearing different clothes. They perform the same job, they collect the same money. It looks like freedom. But it doesn't feel like freedom. 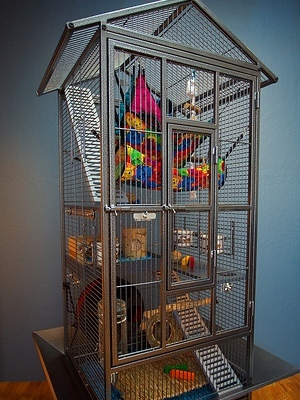 It feels like a shiny new cage. I finally got around to watching Jesus Camp a few nights ago. I've had it sitting in my Netflix queue for a few weeks now, and since the movie was available to watch online via their streaming video service, I figured I'd give it a go. 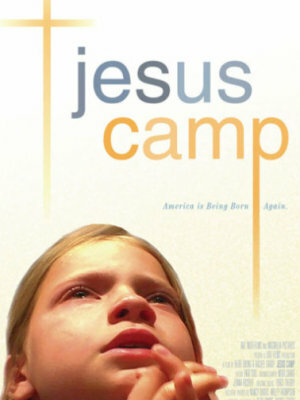 The movie focuses on several children who attend a Christian camp. They're young, ranging from 9 to 12. The camp is very similar in style and content to Christian camps and conferences I attended in high school; obviously, the content I experienced was more age appropriate for me, but the general messaging was the same: "we have to take this nation back for Christ." As a kid, I wasn't aware of the implied political meaning behind that phrase. I didn't connect the idea of "advancing the kingdom of God" and taking over the government (and the world) until much later; watching this documentary really helped put the whole thing into perspective. I'm really not sure how I didn't make the connection before. On more than one occasion, my old pastor would openly suggest that Christians should always vote for Christian officials, and if there were none, to vote for conservative/Republican officials, as though being conservative was somehow connected to having a proper relationship with God. I understand that there are Christians who feel that conservative ideals are closer in alignment with Christian ethics. For the most part, I don't disagree with that opinion. Many of my personal values are rooted in those same conservative ideals. However, I feel that there should be a healthy disconnect between my values and the role of the government in my life. In the same way that it is inappropriate for me to demand that my neighbors adhere to my faith, I find it inappropriate for me to demand that citizens of the nation fall under legislation that agrees with my personal values. The Christian Right disagrees with me. For them, the idea of advancing the kingdom of God, or creating heaven on earth, is about creating a theocracy. And not just here in the US, but across the globe, through the work of missionaries. And the great irony is that the western Protestant movement was born out of a resistance to this very same notion. The Protestant mentality of those who fled the European theocracy helped to birth the freedom of religion that we have enjoyed for the last 200 years. In a bizarre twist, this same Protestant movement is now blazing the trail to recreate the institution from which it once fled. And in a move that can only be called diabolical, the Christian Right has targeted children for their plans for theocracy. It has promoted the use of Christian camps and conferences in order to indoctrinate children - not with the good news of grace found in the Christian text, but with a political message consisting of earthly revolution, overthrow, war, dressed up in spirituality and piety. Hype: This is done through the worship music and through comedic presentations, which at once makes the attendees feel that their excitement and enjoyment is related to their proximity to the presence of God. It's fun, it gets the blood pumping, and it it's unifying. It's a rally. The Pied Piper's music draws them in. Emote: The program takes a turn, and the intent of both the music and the message is to draw on the emotions of the attendees. This is the emotional roller-coaster, and the psychology behind it is very simple. You get people juiced up during the hype phase, and then once their energy level peaks, you bring them back down and make them cry. And the crying is often about the state of the world, the state of the lost, the state of the attendees lives... anything to make the attendees break down internally. This makes the attendees feel like they are drawing closer to God and to one another. Once again, the fact that the entire group is behaving the same way leads attendees to believe that the cause of their emotional response is their proximity to the presence of God. Act: Once the attendees have gone up and down on that roller coaster, they're mush. They can be told anything, because on a conscious level, they believe that their experiences so far have been the result of God's presence; on an unconscious level, they've been psychologically prepared for input. They're exhausted, they're weakened, and they are the captive audience of the people behind the podium. And it's at this stage that the agenda is promoted. If there was ever an appropriate use of the term "drinking the kool-aid," this would be it. Thousands of kids packed into a stadium, all ready to consume whatever the speakers have to dish out. It's frightening, really. So I walk away from the documentary enraged at the state of western Christianity, and disheartened that the name of Christ is being used for political gain. But I lay claim to the knowledge that God is larger than His wayward followers, and that He will work things for His glory. And His glory isn't found in an earthly kingdom built by men.